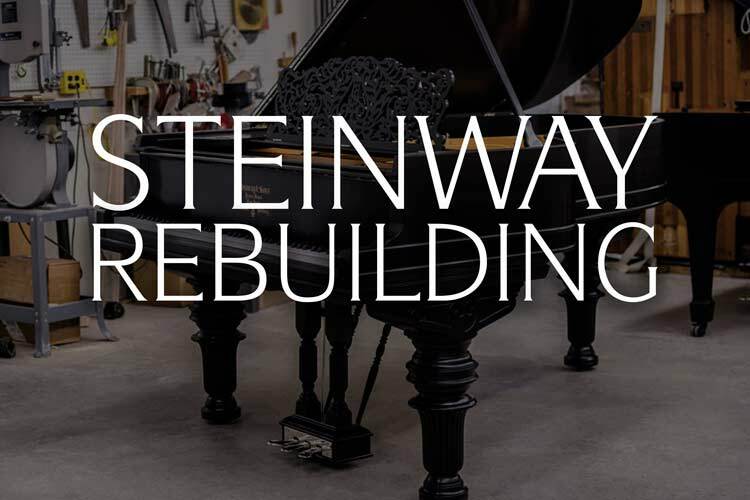 When you restore or repair the beautiful woods and graceful lines of a grand piano cabinet, shouldn’t you have a finish on the exterior that echoes the quality and grandeur that lies on the interior of your instrument? Over time a piano’s finish can slowly wear away and degrade. Eventually, a piano’s cabinet may become damaged and chips and scratches will mar the finish. Refinishing a piano refreshes the look and gives your prized instrument a like new look and feel. The most popular material used in historic piano refinishing is nitrocellulose lacquer. When evaluating lacquer piano refinishing there are two principal methods to consider, those being sprayed-only and hand rubbed. Both of these piano refinishing options are commonly utilized in the industry, so what makes them different? 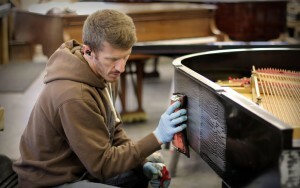 A sprayed-only finish is a method that has gained popularity among many piano rebuilders. This practice takes less time and labor than other established methods. It can be completed fairly quickly and can be done en mass. For a sprayed-only finish, the piano cabinet refinisher starts with a clear, gloss lacquer and sprays coat after coat of finish until they approach the desired thickness. The refinisher then adds a compound called flattening paste to the final coats of lacquer to adjust the glossiness of the finish. Flattening paste reduces the glossiness of the finish by adding particles inside the top coats that reflect light at different angles and absorb light. The more particles added to the finish, the less glossy the finish appears. This provides a measurable degree of sheen (glossiness). This method, albeit quicker and easier, does not allow the finish to reach its full potential. The hand-rubbed technique of piano refinishing requires the refinisher to start with a clear, gloss lacquer. Each coat of lacquer is allowed to cure and it is then sanded smooth before the next coat is applied. This process is repeated until the desired thickness is reached. The finish is then hand-polished and rubbed out to the desired sheen. The result is a completely smooth and clear finish that has no particles suspended in it to reduce the clarity. The hand-rubbed style of finish is the technique that the Steinway & Sons factory uses and is time-tested. However, it requires much more labor and good technique due to the additional steps required. The hand rubbed finish method allows for much more control over the final look and the ability to conduct repairs in the future. This is the process we have chosen to utilize here at Chupp’s Piano Service. Hand-rubbed finishes have a rich and deep appearance that allows all of the nuances of the piano’s woods to be appreciated. Finishes that utilize the sprayed-on method do not have the same clarity. The flattening pace reduces the overall brilliance of the finish, creates a more opaque look and can obscure much of the beautiful wood grain underneath. The sprayed-only finish may leave the showroom with a uniform luster but when piano owners polish or dust a piano cabinet finished this way, they start getting shiny or dull spots. Additionally, those inevitable bumps and scratches your piano will receive are nearly impossible to camouflage on finishes that include flattening paste. Since the lacquer is mixed up to a chosen sheen, the touch-up professionals have a hard time matching the sheen of the finish without having to re-spray the entire piece. This either creates a spotty piano, or additional cost if you choose to refinish the entire affected area. By contrast, hand-rubbed finishes can be repaired and polished up to the glossiness of the rest of the piano. Additionally, it’s almost impossible to spray to perfect smoothness. Most commonly, sprayed-only finishes will have an orange peel surface (similar to the slightly pitted texture of an orange peel) and imperfections from dust in the finish. We have refinished a number of pianos that suffered from a pitted, orange peel finish. With hand polishing, the cabinet is completely smooth due to the extensive sanding and polishing process. The difference in finish quality is very evident, especially when seen on a restored Art Case or Crown Jewel style Steinway. 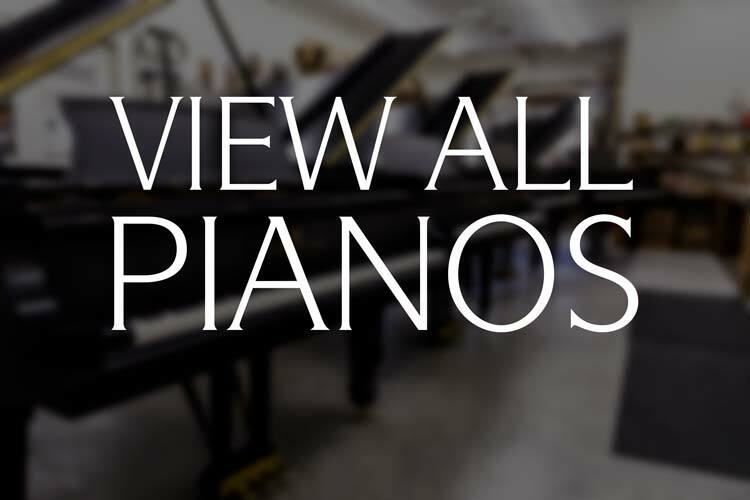 At Chupp’s Piano Service, we blend fine craftsmanship with cutting-edge technology. We start by removing your old finish. Unlike many other refinishers, our finish stripping process does not include any water. Many piano and furniture refinishers utilize water to neutralize the stripping agent. However, any water in the stripping process can soak into the wood and damage the structure of the piano cabinet itself. This can cause loose veneer and many other cosmetic and structural problems. Next, we thoroughly and repeatedly sand the bare wood. This results in a beautiful silky feel and the base for the coming finish. This process is followed by repairing any dents, loose veneer, or other damage to the original veneer. The wood is then stained to the correct color, and paste wood filled. Past wood filler fills the pores in the wood creating a deep contrast and assisting in creating a perfectly smooth end product. Finally, we begin spraying on the lacquer. We utilize the hand-rubbed technique of finishing. We spray and then sand with very fine grit sandpaper, and spray again. We wait in between each coat to allow the lacquer to cure. Then we carefully hand polish the entire cabinet to the desired sheen. Although this closed pore, hand rubbed method is labor intensive, it is well worth the extra care. We use the highest grade instrument lacquer that is completely clear of any flattening paste. Instead of using this paste to control the sheen of the finish, we control this by the level of sanding and hand polishing. This results in a much clearer, quality finish that is easier to repair in the long run. This type of finish comes from a lot of elbow grease – many coats of lacquer, many rounds of sanding, time for drying, then the labor of hand polishing. Even though these methods take longer and require more work, the quality of the end result speaks for itself. There’s simply no shortcut to quality when it comes to the perfect piano finish. (It is important to point out that piano refinishing is just one of the numerous steps in the rebuilding process.) This part of the piano rebuilding process is true, Art You Can See. While many piano refinishers try to cut corners with ‘spray only’ finishes we continue to provide quality, closed pore, hand rubbed lacquer finishes. 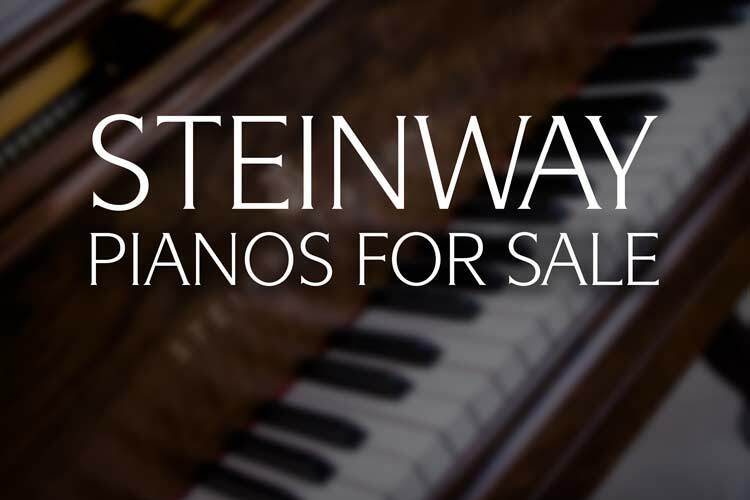 This high quality is what discerning piano owners have come to expect and appreciate. 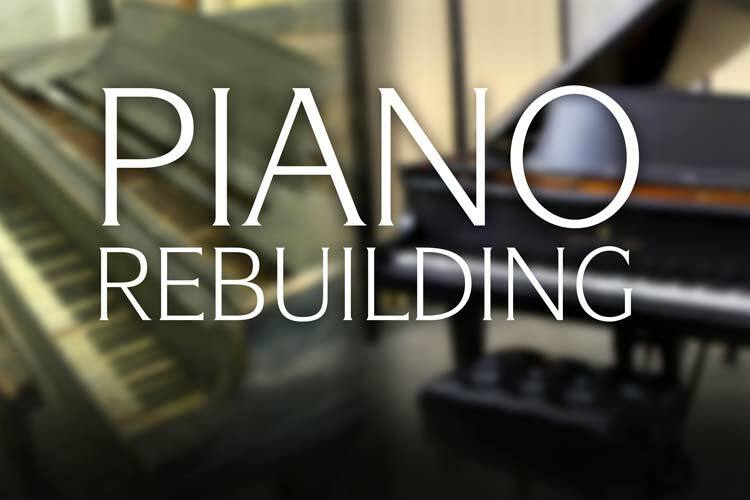 We have over forty years of experience in the piano rebuilding industry. Our dedication to quality has made our services preferred by many universities and professional pianists. 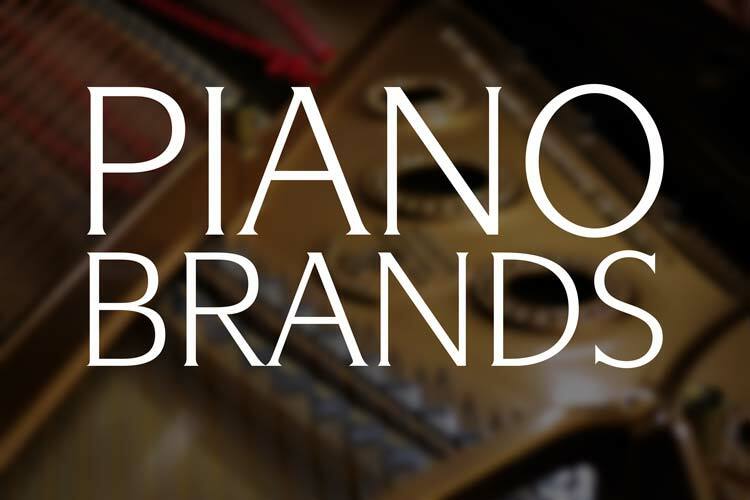 For more information about our fine piano finishes and our vast range of other piano services, contact us today! Error: Error validating access token: Session has expired on Thursday, 10-Jan-19 19:00:02 PST. The current time is Wednesday, 24-Apr-19 23:22:16 PDT.